Looking at the next few days, it appears the atmosphere is more or less in a recharging mode. This entry was posted in Down Day on 2018-05-08 by Lisa Beal. This entry was posted in Down Day on 2018-05-03 by Lisa Beal. _____ — WalMart: searched in vain for a Bruce Springsteen album for Kathy. Fellow traveler Eric Meola photographed the cover art for the “Born to Run” album. The WalMart music section was so disorganized that five of us could not find a single Springsteen album. Bad WalMart, naught WalMart! _____ – Continued on to Penn Square Mall to visit the Apple store (and search for another music store). Phil spent a bit of time looking or the new Apple Watch. We discussed lunch at Whiskey Cafe, but the wait was almost two hours (as this is Mother’s Day). _____ — we head south to Reno and MacArthur, ending up at Lin’s Restaurant for all-you-can-eat steak, sushi, and Chinese food. Stuffed, we return to the hotel, to allow safe storage of our purchases. We take a short break to allow all to regroup. 13:30 — We head up to the National Cowboy & Western Heritage Museum (just off the Kelley exit from I-44). Many great exhibits, a lot of walking, and a visit to the souvenir shop. 16:45 — We hed back to the hotel, then regroup later for dinner. 19:00– Walk to dinner at Frosty Mug (a bar and grill a few doors down from the hotel). We aree later joined by David Balfour, who arrived s bit earlier in the afternoon. The British/Aussie/Kiwi contingent is complete! 22:30 — Wrap up the day by frafting the day’s blog entry. This entry was posted in Down Day, Travel/Positioning Day and tagged 2015, Oklahoma, Oklahoma City on 2015-05-11 by Lisa Beal. 0730 – Wake up; shower; pack, but leave everything in the room since it’s a little ways to the breakfast room and the vans are closer to my room in the front of the motel. 0830 – Ate in the breakfast room. My waffle stuck to the waffle machine, and I was barely able to get it out before started burning. It was so funky looking I decided to do something totally off the wall and put white gravy on it instead of throwing it out and getting a biscuit. All things considered it was pretty tasty, but I certainly got some strange looks. 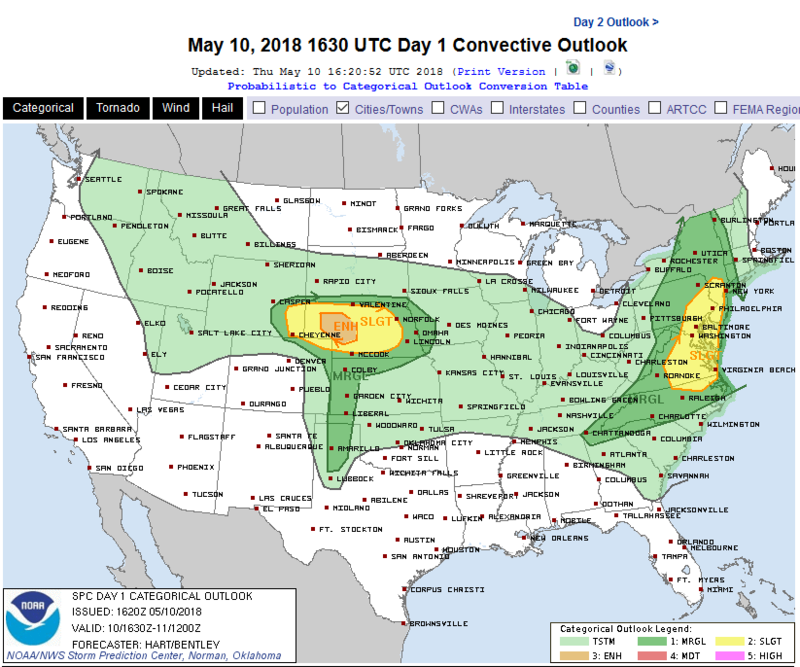 0930 – Meet at the vans; load up; we do a short weather briefing, and discuss what things look like for Saturday and Sunday, which look like our first days with a reasonable prospect for severe weather on the high plains. Patience! 1000 – Depart Cheyenne on westbound I-80, for Laramie, after breakfast. 1040-1100 – stop at the Ames Monument, a tribute to a pair of brothers who made major contributions during the building of the Transcontinental Railroad. ____ – continue to Laramie for lunch at Lovejoy’s: spicy buffalo burger! We do a bit of shopping afterwards. I’m running low on laundry, so I buy a T-shirt to hold me over until I do laundry tomorrow morning. ____ – we rise to 9150 feet in elevation, allowing smaller vehicles to pass us. ____ – As we descend, we hunt for a turnout with a scenic view. The drivers, Bob and Rook, get plenty of practice downshifting. 1600 – We enter Walden from the north; check-in at the motel. 1640 – I chat briefly with the motel manager, whose daughter is fascinated with both storm chasing and Antarctica. I offer to chat with her if she is interested. I wander over to the town bank to buy a couple of roll of quarters, as it has reached the point of the trip or I will need to do laundry pretty quickly. The T-shirt that I bought in Laramie will buy me an extra 24 hours, but no more. 1658 – I get my quarters for laundry, with two minutes to spare before the bank closes for the weekend. I wander around the main strip of town just looking to see what is there and taking pictures of some interesting stuff I encounter along the way. I wander up to what looks like a good place for dinner, the River Rock Café. Looks like they have a terrific menu and I bump into Bob one of our drivers there, who agrees this is a good choice for dinner. 1800 – The gang gathers close to my room to wander up the main street for dinner. It looks like Eric is sitting this one out. I hope he is feeling okay. I order the Volcano Burger, opting for the 1-pound size, because I’m a little bit hungry. There is a 3-pound size available called “the challenge”, but I don’t feel up to eating that and the waiter warns that the burger is extremely spicy, made with jalapeños and habanero sauce. I later discovered that the burger is hotter with every bite, and barely finished 1 pound burger, guzzling several quarts of water along the way to cool my taste buds. I reward myself with a scoop of vanilla ice cream at the end of it all, partly as a self–congratulations and partly to cool the heat of the habaneros that have saturated my taste buds when this time. On my way out the door, I get a farewell hug from River Rock Café’s mascot, Fred the Bear. This entry was posted in Down Day, Travel Notes, Travel/Positioning Day and tagged 2014 on 2014-05-17 by Lisa Beal. 0600MDT/0700CDT – wake; shower; pack bags. Can’t find my neck pod (Sima VideoProp) – later found in my duffle bag. 0850MDT – Pack the vans. test the Diet Coke and Menthos myth: VERIFIED! 0910 – Weather briefing. Another down day today. 0920 – Depart Imperial, NE westbound on US 6. 1040-1140(est.) – breakfast at Kardale’s, Holyoke, CO.
Kardale’s Haystack Breakfast: Hash Brown Heaven! 1250-1400 – We stop at Sterling, CO to look for a replacement 400-watt inverter. Without this key piece of equipment, we have no laptop power and no radar images or weather models. After the team lead and one of the drivers check out several local stores, they find the needed item at the NAPA Auto Parts store. Eric and I visit the Verizon store, in the meantime, to locate a phone battery for his iPhone. 1431 – Entering Raymer, CO, traveling west on CO 14, then angle northwest on County Road 390 toward Wyoming. 1446 – We wander off the main route to Keota, where it looks like they’re doing oil exploration or fracking. 1533 – We continue north from Keota, CO.
1620-1640 – Burns, WY, I-80, WY217 exit – Fuel/snack stop; we enter I-80, heading west to Cheyenne. This entry was posted in Down Day, Travel Notes, Travel/Positioning Day and tagged 2014 on 2014-05-16 by Lisa Beal. 0800 – Breakfast and conversation with chase team. I overcooked my Carbon brand motel waffle because I did not hear the timer ding after the mandatory 2:30 cook cycle. Crunchy waffles are OK, too, once in a great while (LOL). 0830 – Return to my room; brush teeth, re-pack my bags, and work on my blog for a while. 1956 – cross into Nebraska on KS27. Jct US34. Head east. Hotel will be in Imperial, NE. 2157MDT – Rodeway Inn, Imperial, NE. We grab dinner at a local convenience store. Mmmm, hot dogs! This entry was posted in Down Day, Travel Notes, Travel/Positioning Day and tagged 2014 on 2014-05-15 by Lisa Beal. 0630 – Wake; edit this blog site; shower, dress, pack. 0830 – Breakfast: waffle, highly homogenized scrambled eggs, orange juice, toast. 0945 – Pack the vans; weather briefing. 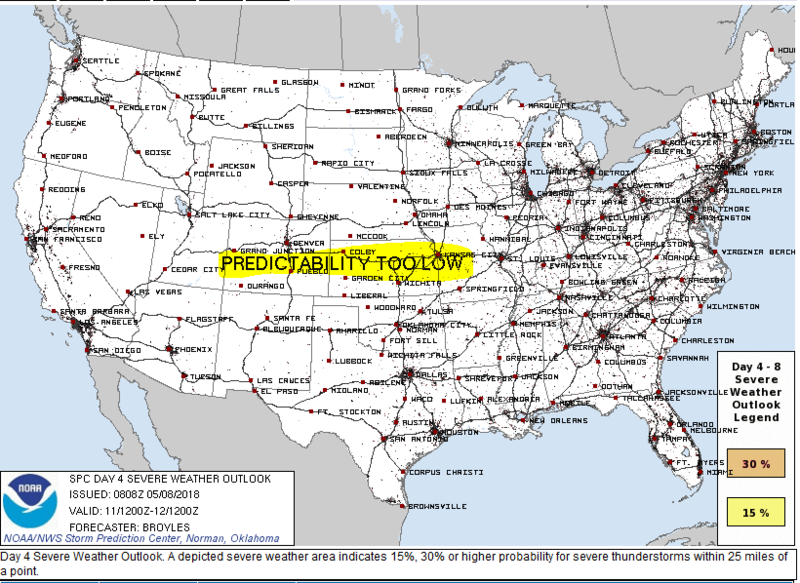 The Great Plains will be quiet until Friday or Saturday. Blech! Time to play tourist on our way northwest. 1035 – Depart Days Inn. 1230(est.) – Enter Joplin. Inspect 2011-05-22 EF-5 damage path. 1315(est.) – BBQ brisket and pulled pork at Sawmill BBQ (612 S. Main St. in downtown Joplin, MO; 417-782-7225). SO MUCH FOOD! 1520 – At Oswego KS, briefly separated from the lead van. Reunited 3 min W of town. 1550 – Reach Jct US160/US169; continue W US160 to Independence, KS. 15 minute pit stop at Citgo. 1825 – Augusta, KS , going W on US400. 1900 – re-enter US400 after meeting with Jim Reed (to get a set of keys); exit to I-235 N, which becomes KS96. EOD – Also ate dinner here: Grilled Chicken sandwich and a diet Coke (with a shot of cherry liquer). This entry was posted in Down Day, Travel Notes, Travel/Positioning Day and tagged 2014 on 2014-05-14 by Lisa Beal.